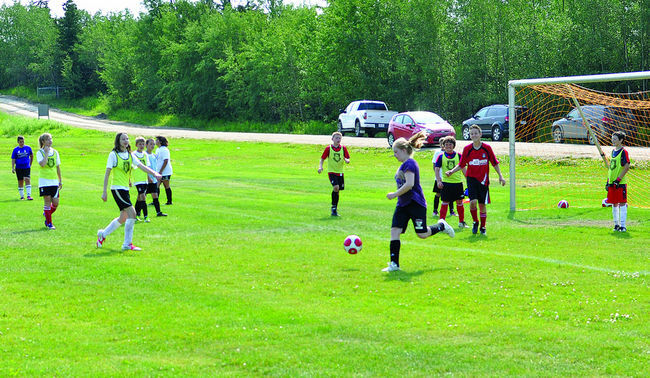 For the fourth year, Cold Lake Minor Soccer has once again hosted a summer camp for kids of all ages to get some practice with the fundamentals. The turnout for the camp was around 100 kids from all over the Lakeland area, and even one from Edmonton who vacations in Cold Lake for the summer. The camp is run by Challenger Sports, a program that brings coaches from the U.K. to teach kids some new skills and some old ones in different ways. “We have coaches from all over the place, a bunch are from Scotland and we got one guy from Wales, for example,” Steve Cupit, the technical director for Cold Lake Minor Soccer, said. Although for many of the kids it may be skills they have learned before, Cupit says bringing in a fresh face to teach it always helps. “Plus you put someone with a British accent in front of them and the kids tend to take them more seriously,” Cupit joked. The camps were split up based on age group and skill level, ranging from full-day developmental camps to mini-soccer for kids ages four to six. The younger groups would focus on building individual skills like ball handling and control, while some of the older and more advanced groups would work on more team oriented skills. Every day the groups would focus on a certain skill to develop, such as heading the ball, which would culminate in a game at the end of the day. One of the other things the camp was doing this year is called the African Cup of Nations, which assigns kids in the camp to different countries in Africa. It becomes those kids job to research their country and design a flag, because on the last day they hold a tournament with each team representing their country. This entry was posted in Cold Lake Sun and tagged cold lake sun, jeff medhurst, Soccer camp scores by jmedhurst44. Bookmark the permalink.